Serve over pasta, veggies, nachos, etc. 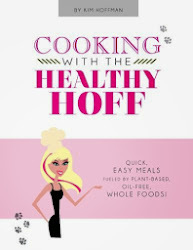 Hoff Thoughts: When eating raw, food should not exceed 118 degrees (depending on who you ask). A Vitamix should raise the temperature of food 10 degrees every minute it is run. However, my Vitamix runs hotter; it's a good practice to use a meat thermometer to test how hot this sauce gets based on how long you run your machine. Three minutes for me = 115 degrees.